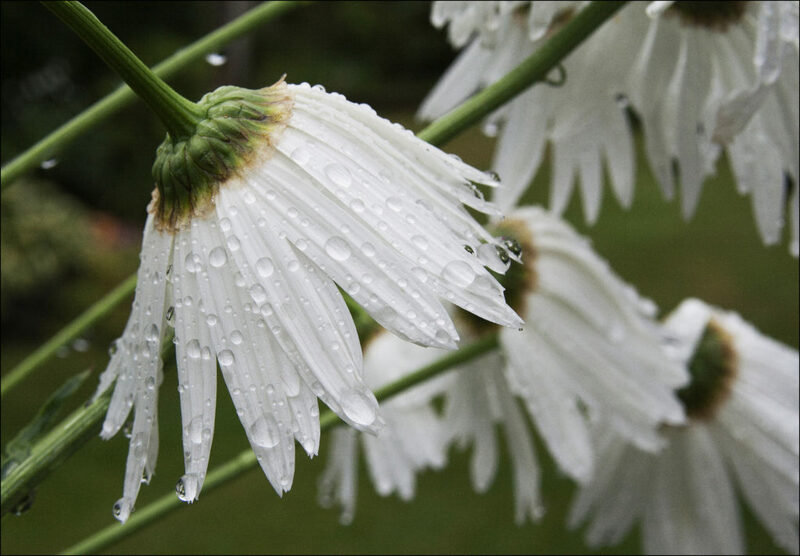 This daisy, bent down by rain drops, looks sad – but I think it’s beautiful at the same time. There’s a beauty when we’re open about our feelings – especially when we talk with God. And how good it is to have God to talk to – about everything, as I found not long ago. Have you ever awoken one morning and realized you haven’t prayed for a while? I did and, being sorry, I got my journal out and started writing God a letter. I want to share it with you because it could be a prayer we all might want to pray sometime. Lord, sometimes I get so busy with my life that I forget to take the time to talk to you. I have troubles, yet stew about them within myself, feeling helpless – hurting. I get so wrapped up within myself that I don’t think about looking up. I forget to bring you in. I forget to ask you to enter and give me the rest and peace I need. Why is it so hard to turn to you? Why do we forget you’re even there? I had a thought, Lord. I’m thinking that most of the time I – and others too – have trouble talking to you because we find it hard to be honest about what’s going on inside. Actually, often it’s simply too difficult to communicate what we need to say – even to God. So we stay quiet, holding everything in, like a child’s hand clutching a coin, fearful of losing it. We’re unable to set the pain, the guilt and the shame free. We don’t know how to express our loneliness – our needs for you, Lord, and for others. And so we can’t even start talking. It’s hard to be open. We’re afraid to trust you with feelings that we’ve kept hidden such a long time. Maybe we don’t even understand our feelings. We don’t know what it is that we have going on inside. For some of us it’s like a deep empty hole – a hunger that needs filling. If we could only realize that all we need to do is talk to you, heart to heart, like the real Person you are. You are able to understand, better than anyone, even when we can’t express ourselves. All we have to do is spend time with you, aware of you with us. Your presence with its comfort and peace fills the hunger in our soul. Your love touches us deeply. It’s healing. Lord, if we could only realize your heart is wide open – ready to receive all that we are and have within. You are ready to listen, never judging, always accepting. The best friend we could have – the safest person in the world to share ourselves with….Tears and all. Thank you for being there, God. Talking to you wasn’t hard at all.